It’s a grand time to be a Marvel fan. The MCU is awash with incredible talent, new stories are coming up for heroes that have long deserved a moment in the sun, and the options for gamers are as good as they’ve ever been. Many Marvel games began as arcade titles, but now there are plenty of ways to experience the superheroes’ adventures from the comfort of your own home. If you’re looking for ways to while away the hours until Insomniac’s Spider-Man game or need a fix before Thor: Ragnarok hits the big screen, then check out these ten titles. Here are the best Marvel video games you should be playing. 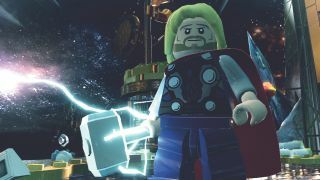 Lego video games have done their work on many a geeky franchise, and Marvel fans are lucky to be getting some of the company’s best work. Lego Marvel Super Heroes gets the whole crew together - seriously, there are 180 characters available. Each of them have special skills for solving puzzles and amassing tons of collectibles in this story of finding cosmic bricks in order to save the world. In other words, it’s classic Marvel AND Lego fare. Play it solo or team up with friends, however you choose to approach it, this game is a delight. After the movie’s success, it was only a matter of time before a game studio would want to take its shot at a Guardians of the Galaxy story. Telltale Games is still working on episodes, but so far the game has delivered exactly what you’d want to see. Smart-aleck Star-Lord and the crew are back in action, chasing another relic that wields godlike power over life and death. And yes, there is some combat, but the heart of the game is in the interactions Peter has with his friends and what path you set them on together. The name does not lie. Just about everything in this open world adventure can be smashed to bits. That’s exactly as a video game about the Hulk should be. In fact, your devastation can be useful, providing cover for defense or new weapons on offense. The combat is loads of fun, and ripping apart a few buildings is a nice way to blow off steam after one of the tense boss fights against Devil Hulk, Mercy, and Abomination. Frank Castle is very different than what today’s fans have come to expect from Marvel heroes. Rather than sass and feistiness, The Punisher’s approach is all about revenge for his family’s deaths at the hands of the mob. Thomas Jane reprises his movie role in Volition’s game, and you guide him through New York’s streets, exploring, sneaking, and of course, killing lots and lots of gangsters. It’s a brutally violent game - the interrogation actions can turn even the steeliest stomachs - but if you’ve read the comics from the 70s and 80s, you know that depiction is true to the original story of The Punisher. Like The Punisher, Deadpool takes the typical tongue-in-cheek humor of the Marvel world and twists it into something dark, but in this case, still hilarious. The deeply meta story involves Deadpool pitching a plan to make “the most awesome video game ever,” even hiring the ubiquitous Nolan North. From there, you’ll encounter time travel, clones, explosions, breaking the fourth wall, and cameos by other Marvel folk. Deadpool is in fine form here as the apathetic antihero. This take on Peter Parker’s adventures is based on the Sam Raimi film adaptation, with Tobey MacGuire as the titular webslinger. The gameplay is pretty standard for a superhero action game. But between missions to take down Doctor Octopus, you can take your time exploring an open-world Manhattan from Spidey’s uniquely mobile point of view. Treyarch makes the hero’s movement feel effortless and natural, a standout technical accomplishment in 2004 that makes this one of the best depictions of the Spider-Man universe. It’s easy to lose hours in traversing the skyline of New York, swinging on a web. X-Men is all about a scrappy band of misfits, and that ethos is a core part of this game. Up to four people can team up to play together, and X-Men Legends at its best when you combine your powers in co-op. Your challenge is to bring down Apocalypse, a mutant supervillain who is hell-bent on kidnapping each of your allies and generally causing mayhem. You’ll level up the crew members and unlock increasingly more powerful attack options - it’s a familiar game style in the noble lineage of Diablo clones. Especially after the gut-punch of the excellent Logan, X-Men Legends 2 is a nice way for fans of this Marvel world to regain a little joy. In a universe this vast, crafting an MMO seems like a perfect fit. As with many MMOs, this one has gotten more fun over time. There are now more than 100 characters to play as, and so very much loot to acquire for all of them. Do whatever floats your boat - complete the story mode for a new hero, team up for a fight against Ultron, or just roam around the recreations of the places you’ve read about in the comics. If you’re looking to pick up the game for console, you’ll want to look for the Marvel Heroes Omega version that released in summer 2017. What a difference a year makes. Shortly after the release of X-Men Legends 2, Marvel Ultimate Alliance took the same formula and expanded it to the broader geek universe with excellent results. The scope of the game grew with the size of cast, offering special bonuses when you team up with friends and all play members of the Fantastic Four, Avengers, or other in-universe squads. There are also alternate endings depending on how many side quests you successfully complete, meaning even more hours of heroic fun to be had. There’s a very good reason why this franchise remains a star of fighting game tournaments around the world. It’s a very, very good game. Even the premise is exciting: who wouldn’t want to see Rocket Raccoon facing off against Ryu? Or Devil May Cry’s Vergil trading punches with Doctor Strange? To prove your worth and skill, select a team of three fighters that you think can best your opponent. Ultimate Marvel vs Capcom 3 stands out as the best in the series for its comic book art style, large cast of characters, and careful finessing of the unique X-Factor and Team Aerial Combo gameplay.